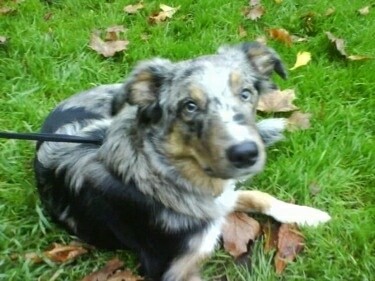 "This is our male blue merle and tricoloured Welsh Sheepdog Max at 11 months old. He is a very active character. Always looking for things to do and never has a moment to settle. Although a lot of people would advise against getting a Welsh Sheepdog as a pet, we are very happy we did as we could not imagine life without him. We used to have a Collie x GSD and although you can see some similarities, it is obvious that the Sheepdog has a lot more energy!! “Nothing gets past Max unnoticed. He is such an intelligent dog. Very loyal, caring, playful and LOUD when the door gets knocked or he wants to play!! It is often him that takes us for the walks and playtime doesn't end until he says so!! "Max has what some people call 'real eyes! 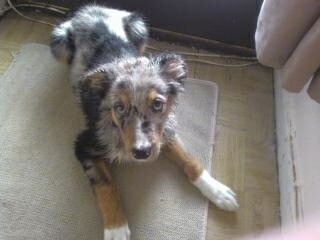 !’ They were bright blue when he was a younger puppy, but seem to change all the time!! His fur does the same thing. Come the summer when he sheds his winter coat, it will be bright blue with his markings!! At the moment, he is still trying to shed his puppy fur, so it will change even more when all of his adult fur has arrived. "He is one year old now and very big!! He is around the same size as an adult male Border Collie and still growing. If he grows to a similar size as his elder sister and other Welsh Sheepdog I have seen, he will be around the same size as an adult GSD." The Welsh Sheepdog is generally bred for its working abilities, rather than its appearance, and therefore does vary in build, color and size. Most are usually black-and-white, red-and-white, or tricolor, but merle markings are also frequent over any of these. Coat types can be may be short or fairly long. Ears are pricked, but usually folded at the tip. The Welsh Sheepdog is a herding dog that is considered to be a loose-eyed herder,meaning he does not fixate his eye contact onto the animals he is herding, like the Border Collie does. The Welsh Sheepdog will do okay in an apartment if sufficiently exercised. They are fairly active indoors and will do okay without a yard. This herding dog is extremely active, and needs a job to do. 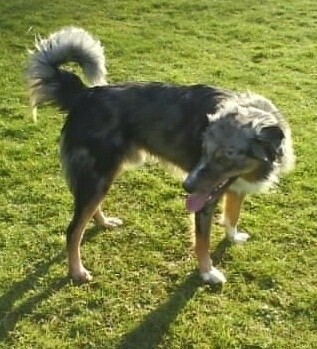 The Welsh Sheepdog needs regular combing and brushing to keep the coat gleaming. Extra care is needed when the soft, dense undercoat is shedding. Bathe or dry shampoo only when necessary. Check the ears and coat regularly for ticks. This breed is an average shedder. 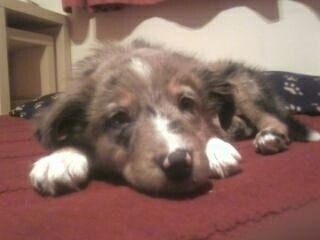 Believed to have been established in the 19th century, the Welsh Sheepdog was developed in Wales. Working collies in Scotland met up with some old native Welsh breeds to form the Welsh Sheepdog, also called the Welsh Collie. Some of the Welsh breeds in its ancestry are the shaggy Old Welsh Grey, the Black and Tan Sheepdog and the sable or blue-merle Hillman. The Welsh Sheepdog Society was formed in 1997.